Have some spare old jeans which you can dispense with ? Go to any Gap store and return your old jeans and get 30% off denim purchases at (selected) Gap stores till March 14th. Initiated by the Cotton Incorporated , the Cotton: From Blue to Green Project takes your old jeans and converts them into Ultra touch Natural Cotton Fibre Insulation for communities in need. The first From Blue To Green denim drive in 2006 collected 14,566 denim pieces across the US, more than double the anticipated amount. Since then, the project has expanded its reach through partnerships with national retailers and organisations including American Eagle Outfitters, Bloomingdales, National Jean Company, Ernest Sewn and G by Guess. 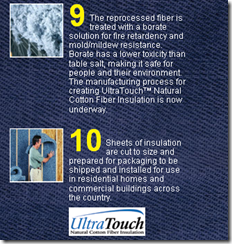 To date, the UltraTouch Natural Cotton Fiber Insulation manufactured by Bonded Logic Inc. has recycled enough denim to create natural cotton fibre insulation for over 540 homes.The COTTON. 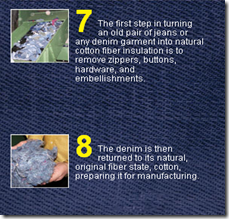 FROM BLUE TO GREEN.® denim drive is a call-to-action to donate denim and give it “new life” by converting it to UltraTouch™ Natural Cotton Fiber Insulation. The insulation is then provided to communities in need to assist with building efforts. UltraTouch™ is composed of 85% recycled cotton fibers and is an environmentally safe, non-itch insulation without carcinogenic warnings, formaldehyde or chemical irritants. It provides exceptional thermal performance and acoustically provides 30% better sound absorption than traditional fiberglass insulation. In addition, it is one of the only insulating products that contain an active mold/mildew inhibitor. PS:This offer is not valid online, at Gap Outlet, Gap Factory Store, or The Gap Generation stores. Not valid on Converse® or Stella McCartney for GapKids/babyGap.